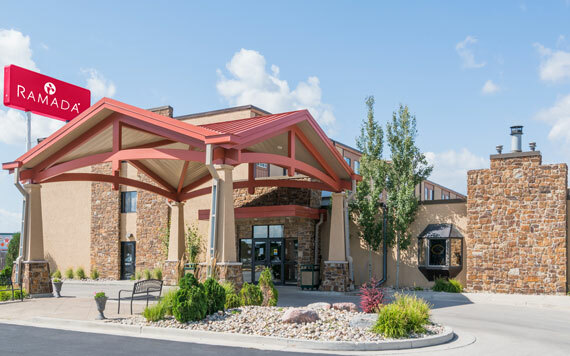 Our Ramada Fargo hotel is conveniently located off I-29, ideal for business and leisure travelers that want to spend time at downtown attractions. Stay onsite and you’ll find an abundance of entertaining options that includes playing cards in our casino, swimming in our heated indoor pool, relaxing in the hot tub. If you’re planning a gathering, our 10 meeting rooms provide ample space to host guests. You can also get to North Dakota State University, Minnesota State University Moorhead, and Concordia College, or corporations like Microsoft and Bobcat. Travel to and from nearby Hector International Airport (FAR) on our 24/7 free airport shuttle. Start your day right with a free hot breakfast, grab a meal at our D’Woods Lounge, and treat yourself to dinner at Bistro 13. Connect to free WiFi anywhere in our hotel: check emails in the business center, stream music for your workout in our fitness center, or watch movies in your room. We offer same-day dry cleaning to freshen up your attire. Each non-smoking guest room features a flat-screen HDTV, coffee and tea maker, microwave, mini-refrigerator, ironing facilities, work space, and air-conditioning. Make use of our free parking lot while you’re here, or reserve your own Fly & Park spot for a nominal fee while you’re traveling. Our accommodating hotel also offers pet-friendly rooms for a nominal fee. Grab a hot dog and watch a baseball game at Newman Outdoor Field, or catch college football at the Fargodome. For a day on the fairway, hit the greens of Prairiewood Golf Course or Edgewood Golf Course. Explore wildlife exhibits of the Red River Zoo, or enjoy the bumper car arena and mini golf course of the Thunder Road Amusement Park. See what the area has to offer at the Fargo-Moorhead Visitors Center, travel through the city’s history at Bonanzaville, or learn about the history of the plane at the Fargo Air Museum. After cashing out at our onsite casino, go on a shopping spree at West Acres Shopping Center, or celebrate with a pint at Drekker Brewing Company.